Our day of wine tasting in Amador County was drawing to a close. 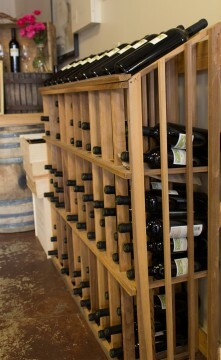 We had already visited Winderotter Vineyard, Bray Vineyards, Driven Cellars, Dobra Zemlja, and Turley. In between, we had focused on our hydration, snacked a bit, and eaten a great lunch. These strategies, plus our habit of sharing tastes, were critical to our ability to remain focused throughout a day of intense wine tasting. We had time for one last winery, so we decided to try a change of pace. After our parade of Zinfandels at Turley, we switched to a focus on Sangiovese and a truly big dog. It turned out to be a great decision. I won’t lie. First, we visited the giant dog’s head. 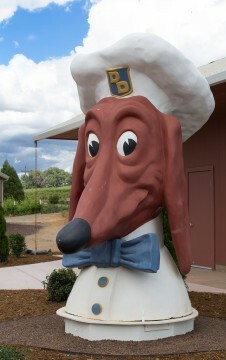 Wine tasting is great and all, but how often do you see a massive dog wearing a chef’s hat, white shirt and bow tie? That is not an everyday experience, and we didn’t want to let it go to waste. 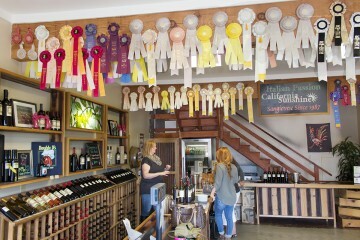 We did, finally, make it to the tasting room, full of wine competition ribbons, sunshine and happy people. The energy in the room rekindled our enthusiasm for wine and gave us our second wind. Or third. Or sixth. Tamara welcomed us and got us started with our tasting flight. First up was their 2014 Pinot Grigio, a real blast from Italy. All we needed to complete the scene was some gelato and it would have been perfect. A nice start to the tasting! Their 2015 Rosato di Sangiovese was next, a rosé with fun floral aromas and a fruit-forward flavor that could stand up to food. Then, we were onto the reds. Our first Sangiovese was their 2013 Sangiovese “Originale”. This was a soft and gentle start to our Sangiovese journey. Their 2013 Sangiovese “Hillside” showed more fruit but maintained the gentle tannins. The 2013 Sangiovese “Marmellata”, with an engaging aroma, was a fruit bomb that really got our attention. Tamara told us that these grapes spent more time on the vine, resulting in bigger fruit flavor. By far the most popular taste among our group was their 2012 Sangiovese “Riserva”. The leather and barnyard aromas and the complex layering of fruit made this the bottle that just had to come home with us. Our survey of Sangioveses complete, we moved ahead with their 2012 Zinfandel “OGP”, which Tamara explained was short for “Original Grand Pere”. This was a punchy, tannic Zin, full of spice and acid. Just what you need beside a rack of ribs. We continued our tasting with their 2012 Barbera “Linsteadt”. There were dancing notes of cranberry on this somewhat sweeter-than-average Barbera. We all liked it! Our final red taste was their NV Rosso “Tuscan Red Blend”, made from primarily Sangiovese grapes (surpise!). This was one great table wine! Well priced, well blended, perfect for a plate of spaghetti and gravy. One last taste remained: a 2015 Frivolo “Moscato”. A great hot-weather wine, this sparkling Muscato was a joy to taste. Even wine tasting athletes performing at near-Olympic levels do eventually run out of steam. That was certainly the case for our team. 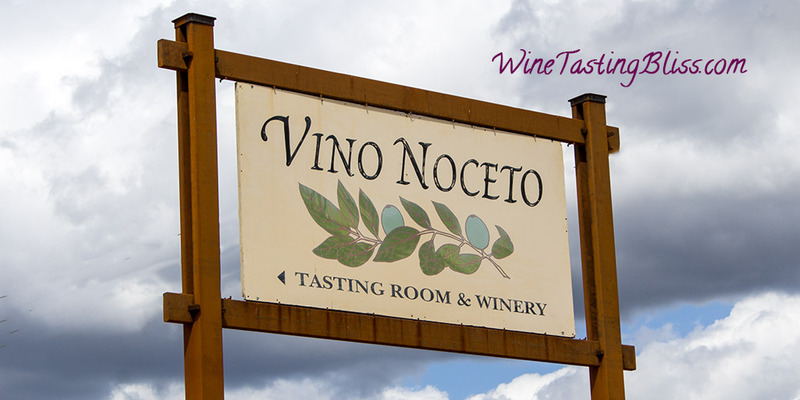 We were thrilled with our tasting experience at Vino Noceto and ready for dinner. It was time to purchase our wine, thank Tamara for all the time and attention, and trundle off to Arnold for our evening meal. We had to prepare ourselves for another day of tasting. This time: downtown Murphys! 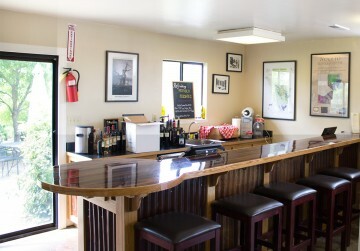 Have you visited Vino Noceto Winery? Click to give'em a tweet of support!